The normal brain is fortunately relatively safe from many toxins animals are exposed to because of the blood-brain barrier (BBB). The BBB is a system of unique brain capillaries, whose endothelial cells and their unusually “tight junctions” between each cell. Those endothelial cells are supposed to keep large molecules and infectious agents out of the cerebrospinal fluid (CSF, the fluid that bathes the brain and spinal cord) and therefore away from the very vulnerable central nervous system (CNS).The BBB is a very effective defender of the brain, unless it is immature (is as the case for all small infants) or unless it is aged or diseased (which is the norm for the elderly, the acute or chronically ill, the highly medicated, the highly vaccinated and for those who are exposed to toxic substances that are known to harm the BBB. Toxins known to harm the BBB include solvents, herbicides, pesticides, viruses, bacteria, street drugs, many pharmaceutical drugs, toxic foods, toxic water, toxic metals (including the aluminum and mercury in vaccines), electromagnetic radiation, etc. 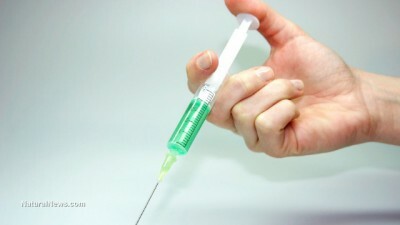 When the aluminum-containing inoculum is eventually injected into the vaccinee’s muscle tissue, the body’s immune system is supposed to produce antibodies (immunoglobulins) against the antigen which the aluminum nanoparticles were adsorbed. The intensity of antibody production varies tremendously, from zero effect to hyperimmune responses.